Mark Whitwell, author of The Yoga of Heart, on the power of receptivity in hatha yoga. Yoga is the natural means of every person’s direct participation in nurturing the source of life. Through intimate relationships of every kind we realize this healing force, because life is about relationships. 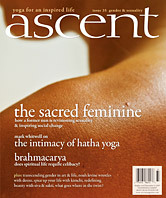 In Hatha Yoga, the ha is masculine and tha is feminine. Hatha Yoga has come out of the vast ancient tradition of Tantra, which is non-dual in its philosophy and based on the understanding that the source of life cannot be separate from the ordinary seen conditions of life. An asana practice is participation in the union of all opposites: left/right, above/below, front/back, inhalation/exhalation, inner/outer, spirit/form. All these opposites contain the male/female equation of life already in perfect union. Hatha Yoga is strength that is receiving. Three of the most important relationships in my life have been with my teachers, U.G. Krishnamurti, Krishnamacharya and my mother. They were perfect examples of the complete mutuality of male and female character, absolutely strong yet totally receptive at the same time. Krishnamurti used to tell me, “A yogi is genderless.” He believed that both genders are entirely active and neither one is dominant. Krishnamacharya’s view was that the non-dual practice of yoga is necessary to be intimate with life in every way. My mother taught me that we are all loved and cared for, and we love and care even if the limitations of our circumstances seem to be suggesting otherwise. She had a caring tangible emotional connection to all things. All of my teachers helped me understand that in our culture, the feminine aspect has been devalued, due to the prevailing social patterns of male control. Men lose out too because it is as much a denial of men as it is of women. Motherhood and intimacy have suffered, and we have very little sexual wisdom in contemporary life. Yoga philosophy is totally the opposite. By embracing experience, we will know the source of experience. If we really practise Hatha Yoga in all its aspects, we become more interested and able to receive life. The whole body is where opposites have perfectly merged. Sometimes it is felt as a measureless depth, an actual location to the right of the physical heart, the portal between source and seen conditions. It is the first cell of life where spirit took form as the union of male and female, and from which the whole spine and cakras flowered. The left/right, above/below, within/without, male/female qualities of life are already in union. I saw this in all of my teachers, but especially in U.G. Krishnamurti. He was a living example of how spiritual transmission can only occur in equal and mutually chosen friendship, not in the more common social dynamic of teacher/student power inequity. This mutuality is one of the vital transformative unions of yoga. When we understand that we do not have to look for god or truth, yoga begins. The substance of reality comes bubbling through, and the current of life flows through us. We find this nurturing force in our natural state and all our relationships. We do not have to sacrifice our own health and pleasure to save this world. In fact, it gives us the kind of energy we need to work tirelessly to ease the needless suffering everywhere. Mark Whitwell is the author of Yoga of Heart: The Healing Power of Intimate Connection (Lantern Books). His teaching schedule may be seen at www.heartofyoga.com.